Spetses Summer School 2019 is an EACR - FEBS advanced lecture course, co-sponsored by the Mildred Scheel Ealdy Career Center Frankfurt. Meet leaders in the field and discover Molecular Mechanisms in Signal Transduction and Cancer! The summer school is co-sponsored by the Mildred Scheel Ealdy Career Center (MSNZ) Frankfurt (www.msnz-frankfurt.de). The MSNZ Frankfurt will be able to cover registration costs for a limited number of participants. 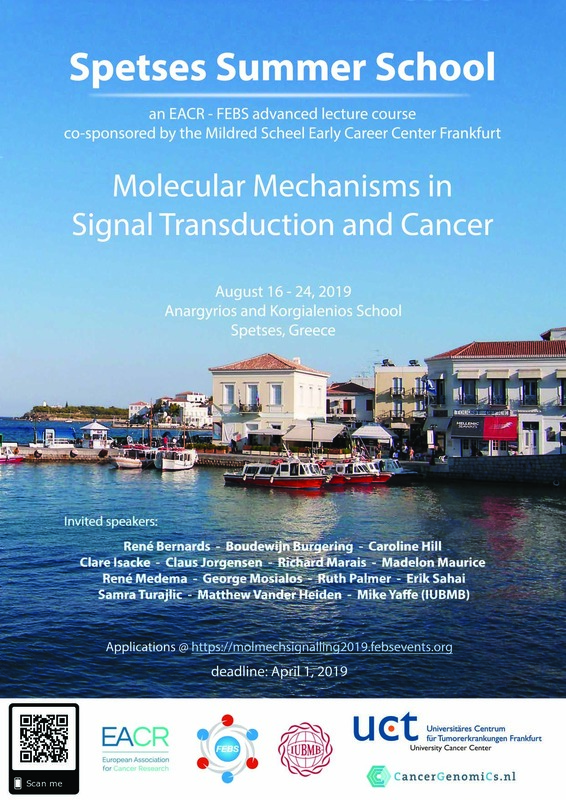 If you are interested in sponsorship of the registration costs, please forward us the confirmation e-mail of your registration for the Spetses Summer School to msnz@kgu.de. Travel costs have to be covered by the participants or their labs. You will be informed by May 1st if you are chosen for participation and sponsorship.